Eliminates Giardia, bacteria, viruses, removes sediment. Each 600 milligram packet provides 1.4% available chlorine, and enough flocculating agent for the clarification and disinfection of 1 L (1.10 qts) of water from polluted sources at temperatures of 77 degrees F (25 degrees C). At 41 degrees F (5 C) two 600 milligram tablets will provide 2.8% available chlorine for the same purpose. Intended for the clarification and disinfection of polluted/suspended water, to make it bacteriologically safe for drinking. Recommended for use during US military exercises. Can also be used for the general public where municipally treated water is not available or where available water is suspected of being polluted. Chlor-Floc contains a combination of flocculation and coagulation agents which promote rapid formation of sediment in treated water (sediment is easily removed by straining the water through a cloth). After clarification of the water the chlorine released by the active ingredients is then free to kill giardia lamblia cysts, bacteria, viruses, and other harmful micro-organisms which are not removed with the sediment. 30 tablets (treats 8 Gallons). Net Wt. 18g. This is the same product used by the U.S. Dept. of Defense, the International Red Cross and OXFAM. 3) Wait for 7 to 10 minutes (or the necessary time) then strain through a piece of broadly woven cloth (t-shirt material, etc.) into clean container. 4) The clarified water is now ready for drinking. 5) If water is still murky add an additional one-half tablet and repeat steps 2 and 3. Q: What makes WaterMakertm Chlor-Floc technology different? 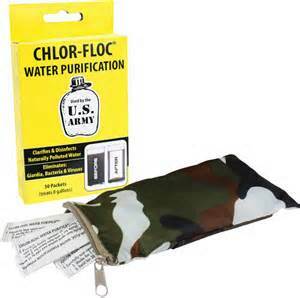 A: WaterMakertm Chlor-Floc is the only water purification chemical in the world that is able to remove turbidity AND sanitize naturally polluted raw water in one step, without the need for any specialized equipment. Other systems typically involve the use of either sanitizers alone or require complicated equipment or treatment sequences that are not suitable for targeted users. Q: Why is it so important to remove turbidity? A: Turbidity provides a protective “screen” around pathogens, which makes sanitizers less effective. Removing this turbidity is therefore fundamental to rendering raw water completely safe for human consumption. To illustrate, it has only recently been “discovered” that one of the primary causes of the ongoing failure to eradicate outbreaks of cholera in the underdeveloped communities is the ability of this disease to lie dormant within zooplankton and then to replicate and spread rapidly once external condition are favorable. As a result of these finding, flocculation/filtration has finally been accepted a vital step in the fight against cholera. Q: Are there any other benefits from flocculation? A: Yes. Flocculation is critical to addressing the all-important issue of Adoption rate by users or user communities. By combing the processes of flocculation and chlorination, WaterMaker’stm unique dual action effectively boosts the sanitizer component, meaning that less chlorine is required to render the water safe. The result is treated water that is far superior in both taste and visual appearance to that delivered by other chemical methods. Q: Has WaterMakertm Chlor-Floc been successfully applied in true field conditions? A: Absolutely. After proving itself in the field during flood disasters in Africa, South America and Southeast Asia, as well as several refugee crises (such as during the 2nd Gulf War), WaterMakertm Chlor-Floc has become the preferred technology of international aid and donor agencies such as UNICEF, the ICRC, the IFRC, OXFAM and others. The product has also been adopted, in tablet form, by several military institutions worldwide – including the US Department of Defense. Q: Is any special equipment necessary when using WaterMakertm Chlor-Floc? A: None. All that is needed is a container (1-20 liters) and a stick for stirring when treating larger quantities of water (hand stirring is also effective). If you don’t remove the dirt – you cannot remove the CHOLERA. Recent research has revealed new strategies in the ongoing fight to eradicate cholera in underdeveloped communities. According to Dr. Rita Colwell, Director of the National Science Foundation in Washington, D.C., the resistance of cholera to traditional methods to prevent outbreaks results from the ability of the bacteria to hide within zooplankton and spread when conditions are favorable. However, the process of flocculation and filtration has now been identified as vital.